The Achilles tendon, sometimes more formally called the calcaneal tendon, attaches the muscles of the calf (soleus, gastrocnemius, and plantaris) to the heel bone (calcaneus). "The Achilles," as it is known colloquially in sporting circles, is susceptible to serious injury when it tears. This is called an Achilles rupture. It may be a partial or complete rupture. Often a pop or cracking noise can be heard at the instant of the tear. While athletes in heavy training and competition are susceptible to Achilles tendon tears, many injuries occur in middle-aged athletes attempting to exercise without progressively building up their physical fitness. 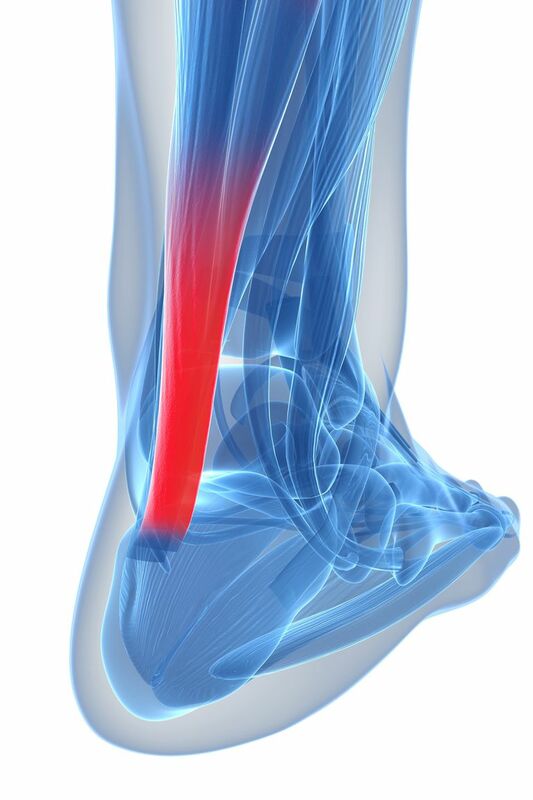 The Achilles tendon is extremely important to motion, and it gets a lot of use in most physical activities. Since it gets a lot of use, the Achilles tendon is also susceptible to serious injury. Achilles tendonitis is one of the more common potential Achilles injury issues. Achilles tendonitis is a typically painful condition that occurs when the Achilles tendon is damaged. Having tight Calf Muscles (Thus, stretching is always highly recommended. Having excessively Flat Feet (It is typically recommended that athletes run on the balls of their feet, rather than with a flat foot). The symptoms of Achilles tendonitis typically progress gradually over time. Achilles is the main heroic subject of Homer's Iliad. He is widely considered to be the greatest and fastest hero of the Greeks during the Trojan War. Achilles is credited with slaying the Trojan hero Hector directly outside of the gates of Troy. To prevent Achilles’ early death, and also in an effort to make her son immortal, Achilles' mother, Thetis, took him to the River Styx, which was thought to hold powers of invulnerability. Thetis held her son by the ankle and dipped him into the River Styx. This made Achilles invulnerable everywhere, except for the one area that was directly where his mother’s fingers had gripped him while dipping him into the river. The water did not touch his body in the Achilles tendon area. Since his spot of vulnerability was his heel, the term Achilles' heel has come to refer to someone’s weak spot. There are several synonyms for an Achilles’ Heel in modern language including a weak point, a weak link, a flaw, an imperfection, a defect, a weak spot, or a chink in the armor. Do You Need Surgery for a Ruptured Achilles Tendon? What's the Right Way to Stretch for Walking? What Is Kayla Itsines' BBG Workout? What Is a Good Finishing Time for a 10K Race? What Are the Most Common Vital Signs Measured? When Can Kids Start Running?